Support our native pollinators! Essential to our own survival, pollinators are responsible for approximately one out of every three bites we eat! Pollinators are in decline, but our efforts can make a difference in their repopulation. According to University of Delaware entomology professor Doug Tallamy, anyone with access to a patch of earth can make a significant contribution toward sustaining biodiversity. His landmark book Bringing Nature Home explains the findings from his research and gives practical guidance on how we can help restore nature, even on the smallest scale. The good news is that it’s within our power to help turn things around with the plants we choose to grow in our own backyard… or front yard or apartment balcony. And his research tells us that it’s working. 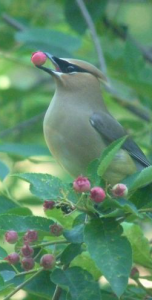 Cedar Wax Wing eating service berries. “For the first time in its history, gardening has taken on a role that transcends the needs of the gardener. Like it or not, gardeners have become important players in the management of our nation’s wildlife. It is now within the power of individual gardeners to do something that we all dream of doing: to make a difference. In this case, the ‘difference’ will be to the future of biodiversity, to the native plants and animals of North America and the ecosystems that sustain them. It’s so simple! Native plants attract and sustain native wildlife, including the native insects that many of our wild birds eat to survive. As wild bird hosts who conscientiously stock feeders and keep water accessible, this presents another great opportunity to lure new visitors to our yards! Professor Tallamy‘s entertaining and educational book, and the book’s companion website, BringingNatureHome.net, are highly recommended for further reading. Not only about the science behind his studies, or the limitless benefits and positive repercussions from making simple changes in your landscape, but also for inspiration and a plan of action. 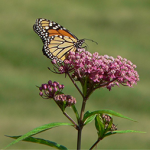 Replace a non-native or invasive plant in your yard with a native! For help with specific plants for our area, we’ve listed several links below to help you get started — just a few of the many, many local resources available. Every Day is Earth Day at The Backyard Naturalist! We are proud that our Backyard Naturalist community celebrates Earth Day every day with steadfast, year round support for our wild birds. 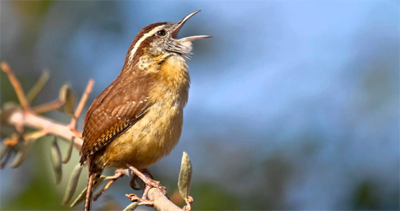 Collectively, our efforts to create these micro-sanctuaries are making a difference! Together, we are helping repopulate plants and add diversity to our environment. 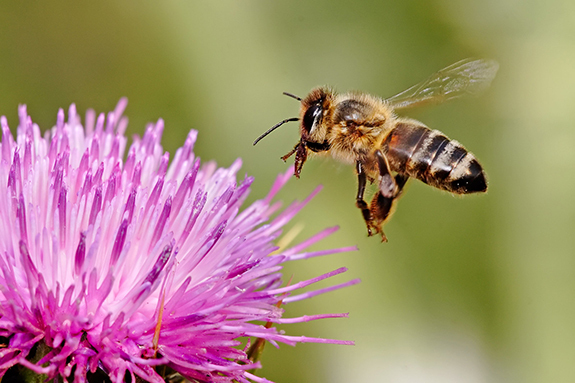 This makes our ecosystem more resilient and strengthens populations of pollinators in decline. Almost 30 years ago, a vision of our own little backyard wildlife habitat connected with those of our friends, neighbors, and customers—and millions of backyards across the country—inspired us to open The Backyard Naturalist store. Please share this with your friends and neighbors and take time to enjoy and celebrate your ‘patch of earth’ on Earth Day—and EVERY Day.